The Bombay high court has directed that a toilet built close to a religious place near Cross Maidan – the over-280-year-old Bhika Behram well, a grade 1 heritage structure – be demolished. The Parsi community has since long been seeking that the toilet, built with consent from the municipal corporation, be demolished. 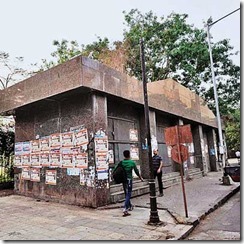 The court order was given by Chief Justice Mohit Shah and justice MS Sanklecha on April 9, directing the civic body to demolish the toilet and a health centre built by the Rotary Club of Bombay Sunrise in 1997. Members of the Parsi community had taken the battle to the Supreme Court after the municipal corporation gave permission to the club to build the toilet, health centre and drinking water facility 25m from the well. The Supreme Court referred the matter back to the high court. During the hearing, the municipal corporation’s counsel told the court that permission had been given at that time due to scarcity of toilet facilities in the area but now that there are at least five facilities in the vicinity, the toilet in question was not needed. The court said that the health centre be razed as it is not in a proper condition and has asked the civic body to take a call about the water facility. Trustee of Bikha Behram well, Viraf Kapadia, said that due to negligence on the civic body’s part, sewage line could connected to potable water line. “We went to court as it’s a sensitive issue,” he said. Counsels for the Parsi community, BH Antia and Homiar Vakil said that a toilet being built near a place of worship was something unheard of.